DISCLAIMER: This article is by no means medical advice, I am not a doctor or registered nurse and I am not providing diagnosis or medical treatment. This article contains information derived from 100's of hours of research. This is for educational informational uses only during a post apocalyptic shtf / wrol scenario. Doomsday has come and the unprepared will not survive. 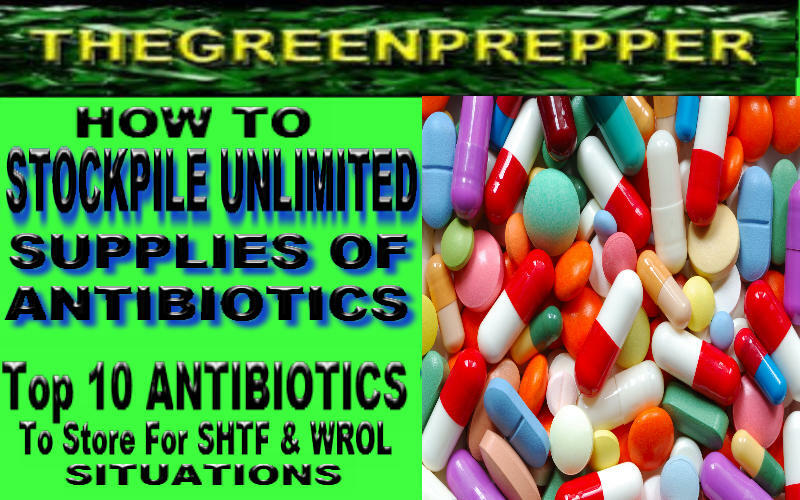 Armed with the knowledge we provide here, you will be able to successfully stockpile an unlimited amount of the right medications legally to get you and your family through any natural disaster or manmade apocalyptic shtf wrol scenario. The biggest killer of human and pet life during disaster and post-apocalyptic scenarios is lack of basic medical supplies to treat the ailments that will afflict and ultimately cause death when modern medical facilities are not available. When self administering antibiotics & other medical treatments it is greatly suggested to have two key books on hand. 1) Nursing Drug Handbook that will tell you what antibiotics and other drugs are used for as well as their expected side effects and interactions with other substances. Knowledge is power. The second book that we highly recommend is the constant #1 best seller covering medical survival and treatment without a doctor. Where There Is No Doctor , is arguably the most widely-used health care manual in the world. Since the early 70's it has been attributed to saving millions of lives in third world countries and is widely touted by the Peace Corps and World Health Organization as a life saving medical manual for village healthcare. A second addition to the Where there is no doctor series, came out shortly after its publication, Where There Is No Dentist also drastically helps with the #2 issue with post-apocalyptic scenarios which is adequate dental care and dental hygiene. Many deaths have been attributed to poor dental hygiene and maintenance. Once you have the two main informational manuals you can be confident on the care & treatment of yourself, your family and survival group. Next is to start stockpiling the top 8 antibiotics for the treatment of all your post apocalyptic bacterial infections. 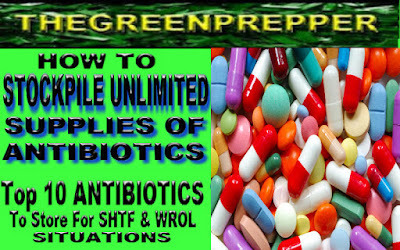 Below we list the anti-biotics that you can easily and quickly stockpile as well as the most frequently treated ailments that each antibiotic is used for. THE SECRET IS PET ANTIBIOTICS. Just as long as the antibiotic is the only ingredient, the product actually is the same drug and dosage as the human prescriptions. These anti-biotics have the same size, markings and come from the same production and distribution plants as the prescribed pharmaceuticals that you regularly get from your pharmacy. You do need to confirm the antibiotics do not have any additives to give you shiny scales or longer fins. Just as long as the product is 100% ANTIBIOTIC you are in the clear. MANY GO BY THE NAMES AMOXFIN, FISHBIOTICS, FIN MOX FORTE & FLEX FORTE. Regulations constantly change, which means access to these COULD DISAPPEAR AT ANY TIME! Do you have any suggestions for those of us who are allergic to penicillin?